Last week's Frugal Friday was amazing as usual. 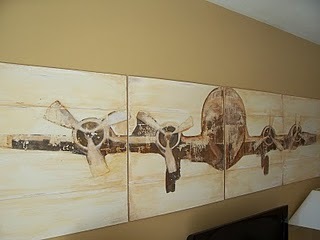 First up, the Cre8tive Outlet shared her fabulous PB airplane art knock-off. I seriously love this! Welcome to the Good Life made this darling ruffled shirt. Another thing to add to my to-do list. The Starr family shared her almost complete master bath redo. So pretty and serene. 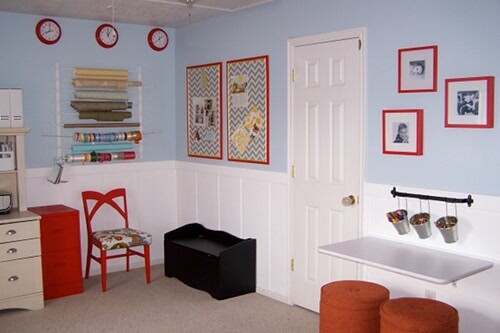 Last but not least, I love this cute office/craft room makeover at Budget Wise Home. 3. Please visit links and leave comments for the authors. I reserve the right to remove posts that are not in keeping with the spirit of Frugal Fridays including but not limited to those posts that link to your shop, those posts that link to a giveaway or linky party, or those posts that don't link back to The Shabby Nest. Let's all play fair, mkay? Come check out our shabby apple dresses giveaway and also check out our Brady post! thanks for hosting! I just love that blue bathroom. Wendy!! Thank you for hosting. Most of my readers come from here. And I like that. :)) I just realized what link back means. (new at this) grabbing your button! Wonderful party! Lots of traffic to my site from here! Your blog is wonderful! Im linking up! YAY! Hope you are well Wendy :) HUGS! I am blushing... thanks so much for mentioning our bitty powder room! You are a gem indeed. I love that craft room, such fun colors. Thanks so much for hosting! That Spa Birthday invitation you did was adorable!!! I just posted #232 a "upcycled" cradle I made for my daughters birthday. Thanks for hosting, I know there is a cost now - I really love and appreciate the parties! P.S I am your newest follower, I hope you will follow me too! Thanks for hosting - I linked up your button to my blog! I'm new to blogging and I'm having trouble linking my post to your Frugal Friday and then linking back to you. I got my thumbnail up, but for some reason it's not recognizing blogger.com. Any ideas why- any help would be apreciated. Contact me at www.lavievintagebleu.blogspot.com. Thanks, and I love your site. Thanks so much for featuring my office. I'm flattered. Hope you have a wonderful day! Thanks for hosting! I'm a new follower & already looking forward to future inspiration! What great projects! Love the office/craft room at the end of the post. I need a space just like that! !